2019 Brings Overhaul of Testing Codes and Payment Changes– Discusses the new coding structure for central nervous system (CNS) assessments and confusion about the Merit-based Incentive Payment System (MIPS). 2019 Code Changes, MIPS Requirements, Oh My! – Explains the major procedure code changes coming in 2019 and how psychologists may be impacted. Midterm Elections Don’t Signal Single-Payer Health Care Anytime Soon – Reviews the current state of health care possibilities following the midterm election results. Psychology and Song – Examines how music can affect us both physiologically and emotionally. Fee Splitting is Unethical – and Sometimes Illegal – Describes the ins and outs of fee splitting and how to remain both ethical and legal in practice. 3 Questions to Ask HIPAA Vendors – Provides answers for three important questions to consider when selecting a HIPPA service. Meeting Needs, Not Schedules – An inside look at the concierge model of psychology, including tips for successful practice. Advertising Offers Must be Ethical – Reviews considerations for advertising psychological services both ethically and legally. Kids’ Behavior Problems Often Misdiagnosed – Discusses the ramifications of different parenting factors on children’s behavior and the misdiagnosing of emotional and behavioral disorders. Drug Tests Add Doubt to Amyloid Theory on Alzheimer’s – Reviews clinical drug trial findings and a new classification system proposed for Alzheimer’s disease based solely on biomarkers. Washington State High Court Expands Tarasoff Duty to Warn – Summarizes the Washington State Supreme Court ruling that mental health professionals have a duty to protect and warn potential victims of violence by patients under their care even in cases where there were no potential victims named. Medicaid Working Under ACA – But With Costs – Discusses Medicaid expansion, ACA coverage and projections for the remainder of the year. Psychology’s Role in the National Drug Epidemic – Provides suggestions for small steps clinicians can take to help curb the epidemic. Exposure Varies in Alternative Practice Models – Discusses potential risks and benefits of alternative practice models. Six Keys to Effective and Efficient Private Practice Marketing – Offers marketing strategies clinicians can use to promote themselves and their practices to develop a consistent flow of clients. Treatment of Simple Phobia – Reviews a case study of a client with swallowing phobia. Confidentiality Limited for Service Members – Provides guidance for civilian clinicians that provide mental health services to members of our military. Metta World Peace – More Than Just a Name – Discusses Metta World Peace’s goals of promoting psychological well-being and reducing stigma regarding mental illness. To Terminate or Not to Terminate? – Offers practice tips for clinicians to use when considering terminating therapy with clients. Course #11-09 | 2017 | 18 pages | 10 posttest questions | Click here to learn more. 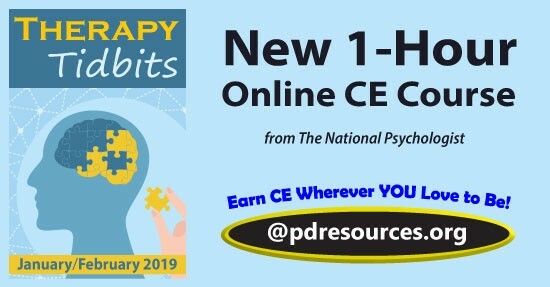 This continuing education course is offered by Professional Development Resources, a non-profit provider approved to sponsor CE by the American Psychological Association (APA); the National Board of Certified Counselors (NBCC); the Association of Social Work Boards (ASWB); the American Occupational Therapy Association (AOTA); the American Speech-Language-Hearing Association (ASHA); the Commission on Dietetic Registration (CDR); the Alabama State Board of Occupational Therapy; the Florida Boards of Social Work, Mental Health Counseling and Marriage and Family Therapy, Psychology & School Psychology, Dietetics & Nutrition, Speech-Language Pathology and Audiology, and Occupational Therapy Practice; the Ohio Counselor, Social Worker & MFT Board and Board of Speech-Language Pathology and Audiology; the South Carolina Board of Professional Counselors & MFTs; and by the Texas Board of Examiners of Marriage & Family Therapists and State Board of Social Worker Examiners. 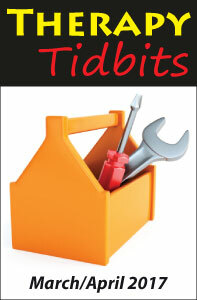 Click here to view all Therapy Tidbits editions.